My friend Martyn Anstey owns an investment company called Invest Colombia. He recently wrote about his experience at the World Urban Forum which was held right here in Medellin’s Plaza Mayor. His knowledge about urban inclinations and his perspective on Medellin make for a very good Business English article. Enjoy! That’s the cost of damage, which will be caused by coastal flooding by 2050 according to the United Nations. The problem isn’t reserved only for far away tropical islands. In the US, 23 of the 25 most densely populated cities are on the coast. With the phenomenal shift towards urbanization in recent decades it’s predicted that 6 out of every 10 humans on our planet will be living in a city by 2030. So where in the world would you expect the heads of governments, the World Bank, global non-profits, academics, etc. to gather to discus this issue? London, New York, Hong Kong, Sao Paulo, Dubai? 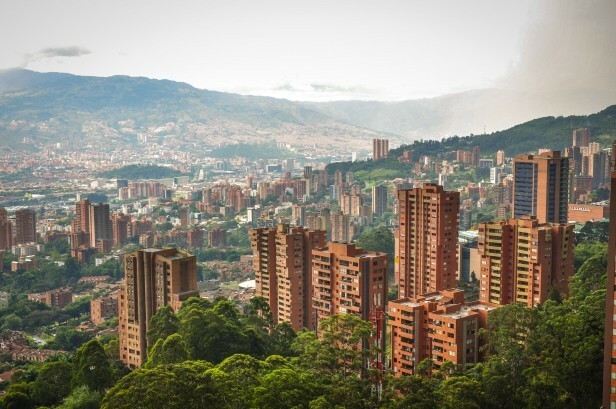 Medellín hosted the 7th annual World Urban Forum where over 15,000 representatives from 164 countries gathered for 7 seven days earlier this month. A fact unthinkable even 10 years ago after it was better known for being the global hub for drugs and being the most dangerous city in the world. But over the last 10 years Medellín has gone through a remarkable transformation. Its local industrious and talented people have worked hard as they’re eager to join the rest of the world after decades of being thought of as criminals, terrorists and drug smugglers. The city is now one of the safest in Latin America, business has flourished with GDP growth around 4-5% per year, and Medellín has been named the “Most Innovative City in the World” by the Wall Street Journal and Citigroup. And now it’s even getting out on the world stage by hosting major global events such as the World Urban Forum. The 15,000 World Urban Forum attendees were encouraged to not only attend the conference but also to get out onto the streets and witness Medellín’s transformation for themselves. Indeed, the Paisas, as the locals are called, rolled out the red carpet with hundreds of local volunteers greeting everyone at the airport day and night, providing free transport around town, free metro cards to sample the Metro de Medellín, and guided tours of a city they are proud to show off to others. Attendees were very surprised with what they found. One senior executive from the World Bank admitted to me that he purchased a panic alarm just for this visit. As he took in the mountain scenery and enjoyed the warm sunny weather, he said he wasn’t expecting anything like this. What he found was a modern city with skyscrapers, an integrated metro system, a flourishing economy, innovative infrastructure investments, and local people who are determined to make Medellín a world class city without losing their strong family and cultural values. And he was about to become even more astonished. As he stood there after riding a local community rental scheme bicycle, he thanked the locals for organizing a great bicycle ride especially for the forum attendees and explained how his “neighborhood” organizes an annual bike ride too and that they should “link up”. A local calmly explained that the people of Medellín enjoy this bicycle ride every Tuesday, Thursday, Sunday and public holiday (which there are many in Colombia). Talk about building a habit. Organic farmers’ markets. Innovative infrastructure. Great mix of a community & cosmopolitan feel at the same time. Outstanding business and investment opportunities. Latin rhythms and warm welcoming people. « Saturday’s Conversation Club / Tour was fun.